Players didn’t have time to explore this mystery further. What could have been the next community obsession in Fortnite: Battle Royale didn’t last long. The floating furniture spotted at the motel area west of Lazy Links is back on the ground. The furniture many players spotted inside houses on the Fortnite island was floating a few inches above the ground and had a blue glow surrounding it. This phenomenon made the community come up with several theories, especially because we were a few days away from the final in-game event involving the cube. What could the cube Kevin bring to the game, and what it had to do with furniture? After the cube exploded, it just turned Loot Lake into Leaky Lake. Nothing changed with furniture in other places, and those that were floating are now back on the ground. 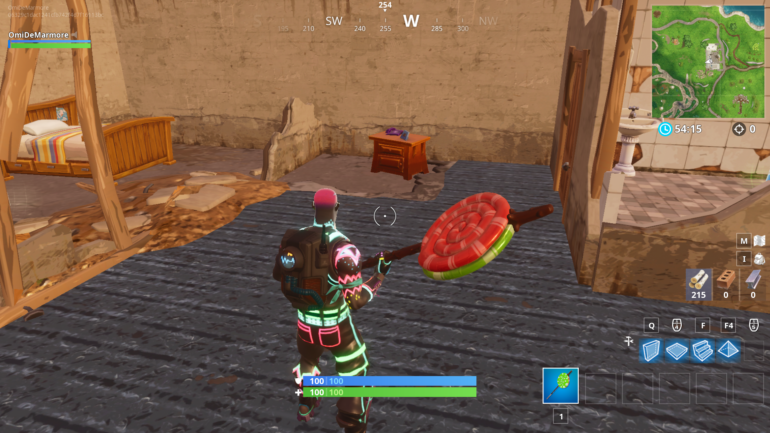 They’re not gone, as happened with the tomato head on Tomato Town or the Durr Burger sign in season four. They are just not floating. It’s a bummer, but it also shows how sometimes players may overthink what they see in Fortnite. The Halloween event Fortnitemares was happening, so the furniture was floating to match the in-game seasonal theme. A weird change in Fortnite meant nothing this time, but we are waiting for new things to start happening as we approach the end of season six.